The Sphynx (also known as Canadian Hairless ) is a rare breed of cat known for its lack of a coat. The contemporary breed of Sphynx (known also as the Canadian Sphynx, distinct from the Russian Sphynx breeds - Peterbald, Don Sphynx) started in 1966, in Roncesvalles, Toronto when a hairless kitten named Prune was born. The kitten was mated with its mother (backcrossing), which produced one more naked kitten. Together with a few naked kittens found later it became the primogenitor of the breed. The first sphynx breeders faced a number of problems: The genetic pool was very limited; breeders had rather vague ideas about sphynx genetics; and many kittens died. 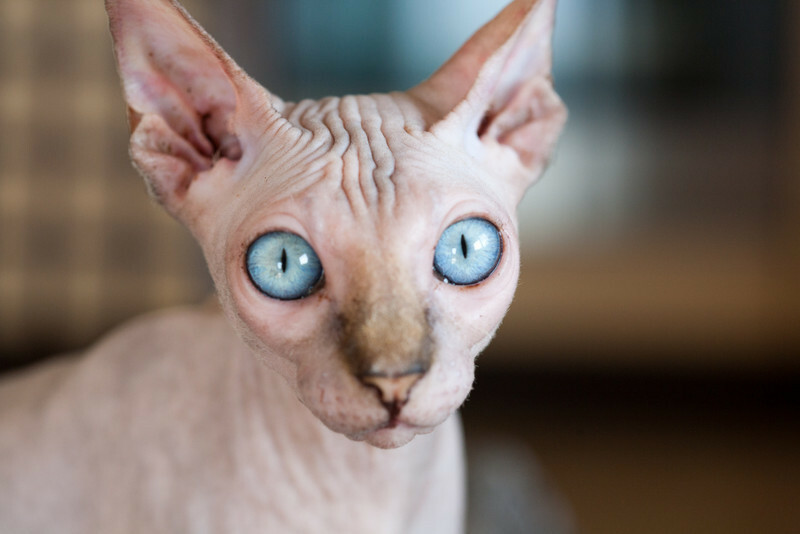 The naked male Epidermis born in 1975 to short-haired mother provided new material to sphynx fanciers and new genes for further breed development. In the early stages of the breed crosses with devon-rex were used, but later this crossing was frowned upon because it caused health problems. Now the Canadian Sphynx is a breed with a sound genetic pool. Outcrossing is still permitted using guidelines set down in the "standards" from each Feline Association around the globe.